The dictionary describes a cairn as a usually large landmark or memorial stone formation. 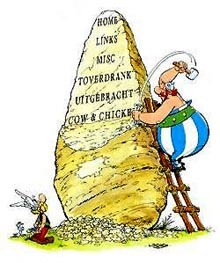 Noticeably scattered throughout Scotland and Galicia, cairns -- and a projectile variant known as hurled boulders or menhirs -- were made immortal in the French comix Asterix & Obelix. On the politically correct surface, it chronicled the exploits of two barbarians and their tribe. Serving as the last bastion of resistance against the Roman usurpers in Gaul, big but somewhat dim Obelix' favorite pastime? Crushing haughty centurions under huge boulders, made child's play by his superhuman strength inherited from a cauldron of magic potion he fell into as a thirsty toddler. The politically far less correct, hilariously subversive subtext of this very famous socio-politix commentary in 31 installments? It required keen familiarity with French affairs of the day, to discern what high-ranking officials and their asinine maneuvers were bawled in grotesque legionnaire or Roman caricature. In the end, all such dunces would always be outwitted and outmuscled by the Gallic party animals who'd conclude the final battle by heaving cerveza mugs, tearing into boar thighs and carting their jovial village chief Macroeconomix around on his shield. Gilles Bélot is Cairn's Asterix, a wily, forward-thinking strategist of an audio designer who used to be speaker house Triangle's technical director before founding Cairn in 1994. Partner Benoît Rabozzi is Cairn's digital Miraculix, repeatedly head-hunted by prominent DSP firms for his expertise but loyally entrenched in Gilles' Gallic court where he operates Ezo. Established as Cairn's intellectual property design house in 2000, it manufactures its electronics while providing soft- and hardware audio engineering solutions for OEM partners in Europe and the US. Cairn is presently distributed in 28 countries, a rather larger enterprise than the relative invisibility of this brand in US dealerships might have suggested. Coming to today's review subject, the name "Fog" for a high-resolution CD player seems anathema to the humor-challenged while being a magical alpine condition when, like Gilles, boulder crawling and mountain climbing are your other hobbies. In tribute to memorable natural vista, specific heights of favored peaks have found their metric values immortalized in certain of his model names. The company motto then simply is Faites-vous Plaisir or Enjoy your Life, a reminder for those audiophiles occasionally wondering whether they shouldn't first get one of those. Available in 24/96 ($1,195) or 24/192 flavors ($1,695 with the retro-fittable upsampler card), the basic Cairn Fog uses the Crystal 4392 chip in fully balanced, dual-differential mode while the upsampler card adds the Analog Devices 1896 chip. Transport duties are handled by Sony's CDM14BL sled. In keeping with Cairn's trademark balanced approach, 4V XLR and 2V RCA analog outputs are provided, as is one 16/44 Toslink digital. The coaxial digital out is MIA. The azure-on-black circular display is très chic while low contrast. It extinguishes by remote command or via automatic time delay after the last input prompt. 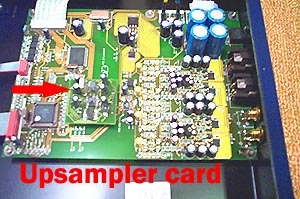 With the upsampler card installed, a little wave decal appears on the display. 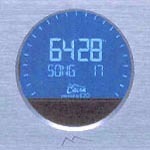 Remotely toggling between the two available digital filters that alter time and group delay functions in the high frequencies causes this symbol to change position. 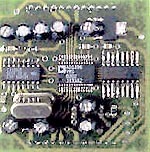 Digital-domain attenuation through the CS4392 is via remote and displayed by the sun dial markers. Certain remote buttons like <</< are touch-sensitive - a short prompt performs one function, a long press the another. The three front panel buttons work the same. From the bottom up, they control power/standby, play/pause and stop/open. Measuring 17" x 3.6" x 12.2" WxHxD and weighing in at 18 lbs, the Cairn is very well made and highly attractive in an understatedly classy way, with the grained anodized silver of the fascia extending to the top cover that wraps around the sides and flanges to the base to avoid unsightly screws on the sides. Like the standard black plastic remote, the optional all-aluminum Roc2 is a complete system commander that controls all Cairn electronics universally. I had purchased my unit going on a year ago solely based on the importer's recommendation who had steered me right before with my Triangle Electroacoustique purchases. I haven't regretted this sight-unseen acquisition once despite the potential affairs promised by the numerous CD players that have and continue to come through here on review. 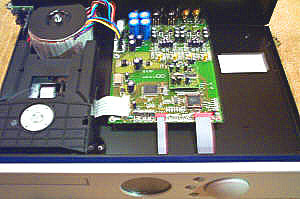 Certain digital pieces have edged it out here or there by the smallest of margins but as a complete package -- looks, sound, features, functionality, that pride of ownership thing, the only minor gripe the lack of a coaxial digital output which a $50 modification will shortly fix -- I haven't come across another sub $2,000 player yet I'd rather own.